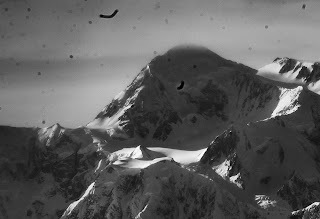 The final image of Mt. 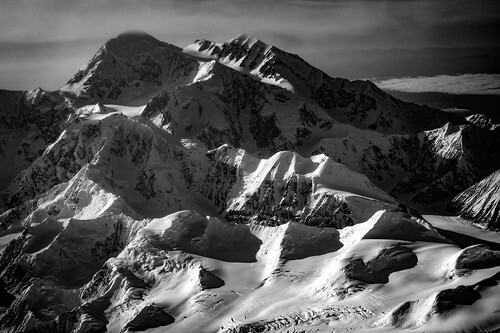 Denali edited in Adobe Lightroom CC and converted to black and white. When I read the recent news about the name change of Mt. McKinley in Alaska to Mt. Denali, I remembered taking a photo through the window of a U.S. Coast Guard P-3 Orion late last year following an assignment in the Arctic. After locating the photos on my hard drive, I quickly realized why I never bothered to process them at the time. They were bad. There was little color, no contrast, and very flat light. That was before I even bothered to notice all the dust spots. Nothing to get excited about here, right? Original raw image shot with a Nikon D3S and 24-70mm f2.8 lens zoomed to 70mm, at 1/400, f13 with an of ISO 250. Still, I did shoot in Raw, so I really had nothing to lose by bringing the photos into Adobe Lightroom CC and seeing if anything could be done to rescue them. After a few minutes of editing, something wonderful began to appear. I am continuously amazed by the power of image editing software, especially Lightroom CC. Not only is it powerful software, but it is really easy to use and incredibly intuitive. While I use Adobe Photoshop CC as well, I find myself using Lightroom more and more as my primary image editing choice. Lightroom has a very good spot removal tool, but because of the amount of clean up needed in this photo, I switched to Photoshop and used a combination of the spot healing and clone stamp tools. However, when you combine the two programs then you have the ability to do some amazing things. Adobe realized this and now offers a photography plan where you get both programs for $9.99 a month. Getting it right, or at least closer than I did with this photo, in camera is still the best thing you can do. But it also doesn't hurt to go back and see if you can turn those overlooked photos into something wonderful.